The protesting family members of a soldier, who was killed in Pakistani firing last year, on Sunday agreed to end their indefinite fast saying Chief Minister Yogi Adityanath had promised to visit their village. 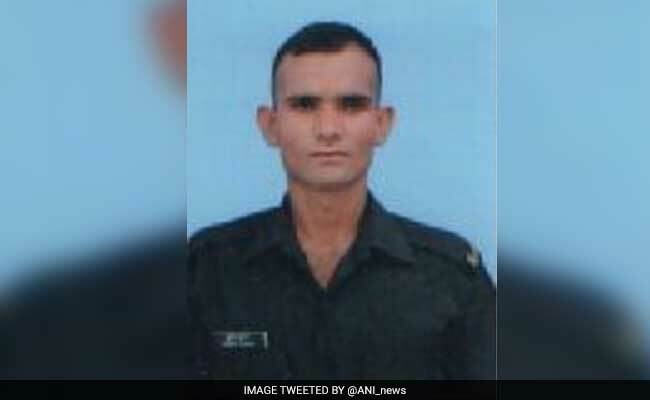 Sepoy Sudesh Kumar was killed last year in firing by Pakistani troops along the LoC in Jammu and Kashmir. Sambhal, Uttar Pradesh: The protesting family members of a soldier, who was killed in Pakistani firing last year, on Sunday agreed to end their indefinite fast saying Chief Minister Yogi Adityanath had promised to visit their village. The Uttar Pradesh Chief Minister, who was on an official tour to Moradabad, met the father, brother and an uncle of the killed sepoy Sudesh Kumar on Sunday. According to family members of the killed soldier, Mr Adityanath promised to visit not only their village but also those of other jawans, who have laid their lives for the country. "The Chief Minister assured us that development work will begin in our village....He also said that he will visit the house of every martyr of Uttar Pradesh," Manoj Kumar, brother of Sudesh Kumar, who was killed along the LoC in Jammu and Kashmir, told Press Trust of India. Mr Adityanath also promised that work for starting an inter-college in the village will begin soon, he added. Manoj Kumar said that Uttar Pradesh's Minister of State for Social Welfare, Scheduled Castes and Tribal Welfare Gulabo Devi will now visit the family to facilitate the ending of their fast. The soldier's family had been agitating claiming non- fulfilment of promises made to them. They had also demanded that the Chief Minister should visit them. The health of the soldier's wife Kavita and mother Santosh Kumari had deteriorated as their indefinite fast entered the third day today. Dr Neeraj Sharma, who inspected the health of the family members on Sunday, said that the blood pressure level of the jawan's wife and one of his cousins has dipped. He had suggested that both of them must be hospitalised. On May 19, villagers and family members of Sudesh, who laid down his life on October 16, 2016, had sat on a fast in the Pansukha Milak village in this district, claiming that the promises made by the BJP leaders at the time of his death remained unfulfilled. His mother Santosh Kumari had said if the Chief Minister did not visit them, she will commit suicide. The family members had said that they had been promised the sanction for a petrol pump, construction of a road and memorial in the village and renaming a village primary school in Sudesh Kumar's name, but none of the promises was fulfilled. We had lost trust in local leaders and that was the reason that we demanded that the chief minister should come to our visit our village, Anil Kumar, a brother of the jawan had said.